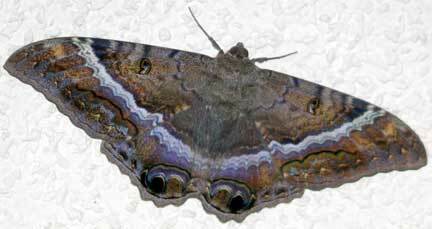 Black Witch moths are making themselves known in South Texas again. The large, harmless moths appear seasonally–we had one at the ranch this weekend. Here’s a great shot from Karen Hermann of the fascinating creatures, which often roost in the eaves of front doors resulting in a creepy “startle factor” when they’re flushed by those returning home. Special thanks to entomologist extraoridnaire Mike Quinn of Austin-based www.texasento.net for helping gather much of the info for this post. The intriguing Ascalapha odorata, sometimes known as “the bat moth” resembles a bat in size and shape and with its seven-inch wingspan is the largest moth in North America. They are common in these parts. Reports of large, bat-like moths surprising people, frequently as they return home and are unlocking their front door, are not uncommon. Because of their dramatic size, when these big boys flush, they get your attention. Had a female one on outside door frame for two days. Far northern Wisconsin, just 20 miles south of Lake Superior. Got good picture, wasn’t beat up. Never heard of this moth before. Took several people to help identify it, but definitely female Black Witch – 6 1/4″ tip to tip. Beautiful to see. Don’t believe in all those superstitutions, but we’ll see. I startled a male outside the door on my way to work before 7 am. It scared me. It was the size of a bat fluttering his wings. I closed my front door and it disappeared hoping that it didn’t get inside my home. I warned my family that I was unsure if it was inside. That night it was discovered in my living room and quickly went into hiding. Early in the morning my son was awakened by sounds repeatedly scratching the walls in his room. He turned on the light and the moth went into hiding. Being determined to trap it He laid awake listening. That morning, 4 hours later he discovered it after moving his TV stand perched on the carpet. He caught it in a large container and released it outdoors. I was glad. Although these moths are harmless, they are creepy. Found a female last night in Houston, Texas. It flew in my garage. While the witch moth is associated with death in Mexico, in the Bahamas it is an omen for winning the lottery. So far, I have not been affected either way but I will buy a few lottery tickets today so that I am prepared for the Bahamas folklore. When I was a child of 6 living in Uvalde TX in 1977 I had a huge 10 inch moth in the house of my parents in the bathroom. I often sat and watched the moth for hours and it did not move for days then weeks. Then one day it was gone. I am now living in the northwest and have told the stories of the huge moth to other children as I grew up. They were just as interested as I was. I am down here in Costa Rica and the first night, I saw what I thought was a bat fly off as soon as I opened my front door. A few days later (today) I saw it again on the wall and realized is is a moth. I have a few pictures, so I decided to do some research, which lead me here. Found a large male under the eaves of our house in San Diego. I’ve been trying to coax it to hang out over our front door, so I have a reason to buy lotto tix. Definitely not gonna let it in the house. Not for fear of bad luck for me and my family, but we have a couple of cats that would love to hunt it down. Took a few pix and would mistake it for a bat if I saw it flying round at night. 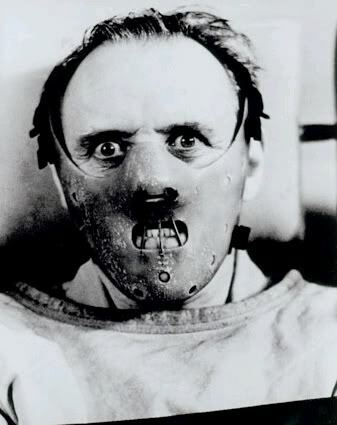 We are also huge fans of “Silence of the Lambs”. Thanks for the education! July 2, 2015 We currently have one resting on our deck in Brighton, CO. I have taken several photos of it and it is indeed a male-no white stripe in the midline of its wings. We have never seen one here before and are rather intrigued by it. 6 miles south of Gering Ne. We have had one of these moths hanging around the last few mornings. Have not been able to get a picture. Thought it was a bat at first. In the movie Silence of the Lambs, serial killer Hannibal Lechter inserted cocoons of Black Witch Moths into the mouths of his victims as a weird gesture of transformation. ” is *not* a correct reference to the plot of “Silence of the Lambs”. 🙂 At the time this cocoon stuff is happening, *fortunately* Hannibal is already behind bars! Actually Clarice Starling (played by Jodie Foster) consults with Hannibal Lecter (played by Anthony Hopkins) to help track down the killer who is doing the “cocoon” thing. Not only two of my favorite actors, but based on a novel written by Thomas Harris (who I wish would write *more*, but I guess it’s not too much fun for him to actually write 🙁 ). Last but not least, I’m not sure, but I think I just saw one of these moths! (Round Rock Texas) Thank you *so* much for your site! Had one fly into my patio in Las Cruces, NM this evening at dusk, thought it was a bat till it landed. Correct me if I’m wrong, but Hannibal Lechter didn’t put moth pupae into the victim’s mouths, he helped law enforcement find “Buffalo Bill” who was using the pupae (and raising the moths in his basement). Cool moths. I would love to photograph them but I’m a little far north in Michigan! I found one on our screen door today. At first I thought it was a bat. These insects are my biggest fear, i would freeze and start crying i one of those was in a room with me. We have a Black Witch Moth outside our front door this morning! We’re in San Diego and are trying to get a few pics. We have a black witch moth outside our front door this morning! We’re in San Diego and we’re trying to get a few good pics. It makes me sad that so stunningly beautiful and benign a creature (I found an injured one some years back and it rested on my hand for an hour) has inspired associations with death and murder. This post would have been so much nicer without that horrible photo of Hannibal Lecter. This is so interesting. Having relocated recently from Minneapolis to Cape Coral, I have not seen this species of moth. Thank you.